…BUT you really don’t know where to start, how it all works, or even who to ask! It can be overwhelming. But that’s where I come in. My name is George Kosch, and a few years ago, I was just like you. I had a burning desire to start my own Internet-based business – because I knew I’d love it – and I was seeing people all around me getting RICH for doing almost nothing! I had to get a piece of that action! And shows you how to do it the RIGHT WAY! My book will SAVE you months and months of research and “trial and error” frustration. The key lessons I learned are all laid out, in clear well-written American English. Without Investing OR Risking A Dime! Well, if you don’t know how to build a list in the SMARTEST and most COST-EFFECTIVE manner possible, you simply CANNOT succeed in Internet Marketing. And it’s all about knowing HOW to generate a PROFITABLE list!!! 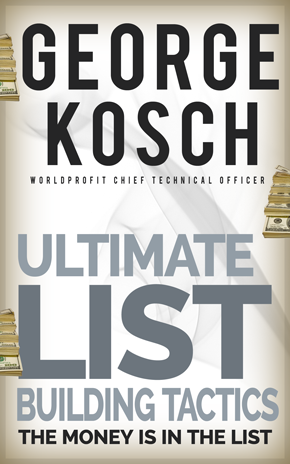 Some people spend WAY too much money building a list – and they can NEVER get their money back! But if you read my new book on List Building for Internet Marketers, you’ll receive a fascinating combination of new and old list building tactics that have been working since 2010 – and are STILL working now, here in 2015. That means they’re PROVEN – not fly-by-night “gimmicks” that leave you flat when they die out. Now, to be clear: I'm going to only share what's working RIGHT NOW. 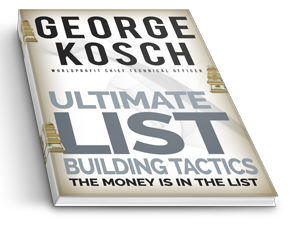 In my book, I go into great detail on how the older tactics for list-building came about – and how they’re still being perfected TODAY. This is VERY important information if you’re SERIOUS about being a successful Internet Market. It’s ALL about the LIST! You’ll learn not just the tactics themselves, but precisely which ones have built me the most subscribers. I also tell you the ones are working the best for me right now. If you don’t GRAB the life-changing information in this book, shame on you! You must not be a serious Internet Marketer if you don’t comprehend the value of the LIST – and why you should be doing everything you can to get the BEST list at the LOWEST cost. What I’m revealing in my book is life-changing knowledge and information. In fact, it’s the most powerful information that I’ve ever come across online. depends on fresh lead flow. In fact, ideally, you need AT LEAST 250 new leads every single day. How do you GET those leads? You’ll see that none of this has to be expensive. You just have to know what you’re doing, and spend your money AND YOUR TIME very wisely. I show you how to do both. I also give you insights that show you how to LEVERAGE your subscriber list and make TONS OF DEALS that increase your LIFETIME VALUE. All of these factors are part of the SUCCESS EQUATION that I reveal in my book. It’s a #-part “formula” that you MUST get right – or risk ending up on the rocks. Basically, I show you tons and tons of list building methods and strategies that will CATAPULT you from where you are to where you want to be. • I cover everything from Joint Ventures, Giveaways, Solo Ads, Ad Swamps, Click Banking, Pay Per View, Barter, Affiliates… you name it! Literally EVERYTHING you need to become a SUCCESS through Internet Marketing and List Building is covered in this book. And NOW is the time to ACT! All you have to do is read the newspapers and magazines to see one person after another talking about how their online business is making MORE money than their “offline” biz! Isn’t it time YOU got a piece of that action – like I did? I’ll teach you EVERYTHING I learned the hard way – so that YOU can learn it the EASY way! The price? It’s very fair. You get ALL this for only $17. Plus, my book comes with a 30-Day 100% Money-Back Guarantee… meaning you can try it out for 30 days and STILL get your money back if it doesn’t seem right for you! So click here to place your order RIGHT NOW, and you’ll soon be starting on your journey to SUCCESS at levels you’ve only DREAMED of before. George Kosch Capt (Ret'd) MSc. Copyright © 2019 GeorgeKosch.com - All Rights Reserved Worldwide.